The battery packs arrived a week or so ago, which was a real surprise. Just the cells though, no bus bars or holders, so I can’t actually get on with building the batteries. They were repackaged to conform with the transport laws regarding Lithium batteries (two cells per inner package, all in an outer package strong enough to survive a drop from 1200mm is a quick summary i think). 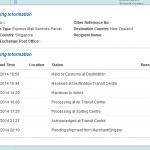 Sent via TNT as two packages, they arrived in about 4 days (China to New Zealand). Hopefully the rest of the battery parts are in the other two packages. These were sent the same day via Singapore Post, and the tracking (click on image below) seems to show they have spent several days in various transit points before being “handed over to airline”. 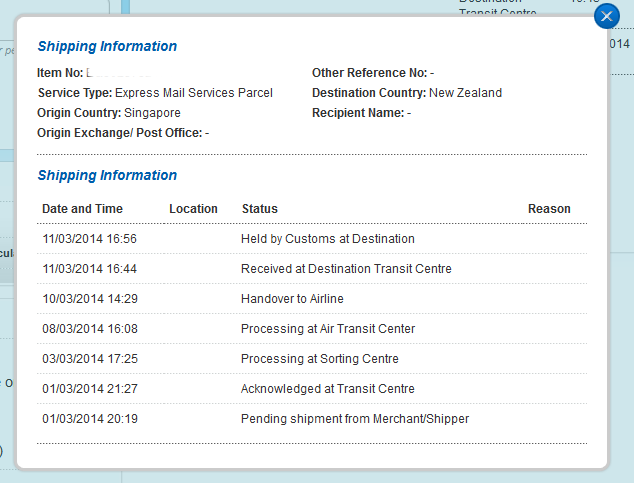 Because mail doesn’t travel by Dakota DC3 anymore, they arrived in New Zealand less than 24 hours later. Both packages have been “Held by Customs at Destination”. Now I am all in favour of the Customs guys and gals, and what they do, but I know this is going to slow the package down by a few days, probably while they sort out a bill for the GST on the purchases, seeing as the two parcels together will be way over the limit for importing without GST. Bugger! The good news is that they are on the way! This weekend I am taking part in the Relay For Life in Porirua, so my weekend is a little bit stuffed – I also predict the parcels will arrive on Friday afternoon and I won’t be able to touch them until Sunday, when I will be too tired and sleep deprived to make any sense of them! Maybe I’ll be able to do simple stuff like transfer the tyres and tubes to the new wheels. I am also doing lots and lots of research about the wiring diagrams, how Hall sensor motors and controllers work and a whole bunch of other things. There is some really useful stuff out there on the Web, which is a good thing, knowing the tendency for Chinese suppliers to be a bit sparse with their documentation. I have also started collecting the right tools together. I already had a crank removal tool, and a spanner for the bottom bracket lock ring, so the PAS is all sorted. I just ordered a Shimano cassette removal tool, as at the very least I will have to put the 7 speed Shimano gears onto the new wheels, and in the worst case have to transfer the gears off the old bikes. There will also be some heavy duty soldering required for the Anderson connectors I am using, so I will be getting a very directional nozzle for my 600 degree electronic heat gun (not a great fan of naked flames in the workshop). Everything else is already in the workshop. I have also planned the battery build down to very fine detail in my head. The “Safe Cases” I am using will have very limited space around the battery components. The width will allow 4 cells in their holders exactly! The height, after I put some PVC foam board in the bottom to remove the effect of the rounded corners will allow 3 cells vertically with 10mm spare, and the length will allow me about 25mm at the end of the pack of cells to install the battery management system and all the wiring to the charger plug and discharge socket. So it is absolutely essential that it is neat and well thought out, to eliminate bunches of wire etc. No duct tape in this battery! NZ Post and Customs have very efficiently contacted me regarding supplying an invoice for the parts, and confirming they are for private use, and also invoiced me for the GST on the supplied invoice amount. I have paid, and hopefully the parcel will be released on Monday for delivery. Also just ordered 4 Continental Touring Plus tyres, and two bike racks for carrying the batteries. We took a trip to Jaycar and bought a bunch of connectors, and some 8 guage wire for connecting the battery up. I have bought the soldering attachment for the heatgun, and the Shimano Cassette Removal Tool is winging it’s way from Australia as I write. Just a few minor issues around switching and charger connection to think through and sort out.